In addition to its antiseptic properties, hydrogen peroxide is used in water treatment, textile and paper bleaching, as detergent, and as an oxidizing agent. But despite its many uses, the production process can be expensive and harmful to the environment. This summer, Randolph chemistry professor Jesse Kern and Yuriy Snyder ’19 are working to find a cheaper, greener solution. 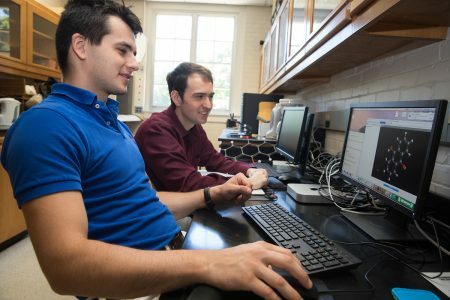 For a Summer Research project, Kern and Snyder are using computational modeling to develop a simple surface catalyst that would allow production of hydrogen peroxide directly from hydrogen and oxygen gases, without the need for catalytic nanoparticles or multiphase reactors. The project is a continuation of sorts from Kern’s research in graduate school on surface phenomena and surface structures. For Snyder, who is a chemistry and physics double major, the project is exactly the kind of research experience he was looking for.